The first thing most people will notice about the Nike Lunarglide 5 is that it is a good looking shoe, good enough that you may even find yourself wearing to normal trips to the grocery store simply because you like the way they look. Some of the color combinations you can find them in are gray and bright orange, black and green, gray and blue, and you can also find them in red, black, blue, and white. The top part of the shoe is made up of two layers of material separated by flywire bands that go up either side from the eyelets to the sole. The inner layer of fabric is tightly woven while the outer layer is a more open and stretchy mesh. It’s design features small slits along the sides that give it a blurry texture as you run, making you appear to be running faster. The tongue is sewed in on the sides, and the limited number of seams makes it fit very comfortably even without socks. This is great news for people who love to run without socks, as the seamless inside lined with silky smooth material forms tightly to your foot. The laces themselves are thin and flat, and won’t create pressure sores on the tops of your feet no matter how tightly you tie them. There is a firm plastic cradle of sorts at the back portion of the shoe that provides some heel support and although it sounds like it could be uncomfortable, there is a nice amount of padding around the ankle collar and it is covered in soft material. The overall design and comfort level of the upper part of the Nike Lunarglide 5 is rather impressive. The Lunarglide 5 certainly has a different feel and fit than most Nikes. Although there is more than enough space in the front part of the shoe, due in part to the stretchy material used for the upper part of the shoe, it can be a little tight in the midfoot region. This does improve as you break the shoes in, however, people with larger volume feet are advised to consider these shoes carefully, and use a thinner insole to help with the fit. The Lunarglide 5 is definitely a soft shoe, and great for people that like soft shoes and lots of heel cushion. 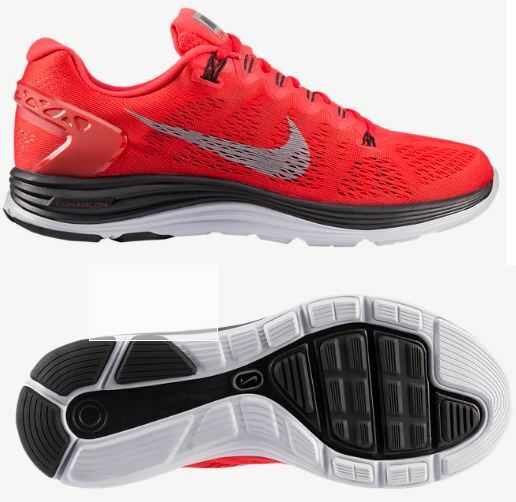 The feel of the sole can be compared to the Nike Lunaracer, but it has a slightly higher profile than the Lunaracer. It’s also comparable in feel to the Adidas Energy Boost. For those who need a firmer shoe, particularly in the heel, you might be better off with the Lunaracer. On the bottom of the shoe, you will find that the Lunarglide has rubber in all the major wear spots, which means it’s been built to last. Testers have reported that evern after 30 miles running on roads, there’s no significant or unusual wear and tear on the soles. This shoe performs well overall, although many people that have tested it are not extremely impressed by it. They are certainly comfortable to run in and give the runner an amazingly soft glove-like fit for their feet, so people who value comfort will really like this shoe. One potential problem with people who tend to pronate is that they may experience some irritation and possibly blisters along the inner part of the ball of the foot right behind the big toe. The most likely cause of this is the snugness in the midfoot region. People who have had problems with other shoes such as the Skechers GoRun, the Nike Pegasus, or the Nike Free may consider passing on the Nike Lunarglide 5 because of this problem. People who have problems with pronation tend to need a more stable base, particularly in the midfood region. If you have had your form checked or you know you have this problem, check out some other shoes that have a firmer midfoot region than the Lunarglide 5. If not, then you shouldn’t have to worry about these blistering problems. The best type of runner that the Nike Lunarglide 5 is for are those who are looking for a lightweight trainer with a snug midfoot fit and overall comfortable feel, a soft sole, and a very squishy heel. The deep softness that this shoe offers in the heel would be particularly great for people who have a prominent heel strike. What these shoes are designed for are long runs, so if you do a lot of long distance runs, these just may be the shoes for you as you can stay comfortable no matter how far you go in them. This is also good for people who like to run in the evenings after a long day at work and getting up to run just seems like way too much work. All you have to do is slip on a pair of Lunarglide 5s and you will instantly feel all the cushion that is sure to put a bounce back in your step. The Lunarglide 5 is part of Nike’s Lunar shoe series which includes shoes such as the Nike Flyknit Lunar2, the Kobe 9 iD, the Nike Hyperdunk 2013 iD, the Nike Air Max Lunar90 iD, the Nike Lunar Force 1 VT, and the Nike LunarEclipse 4. The sole of all these shoes is the Lunarlon platform, and the Lunarglide 5 is a shining example of what these shoes are meant to be. 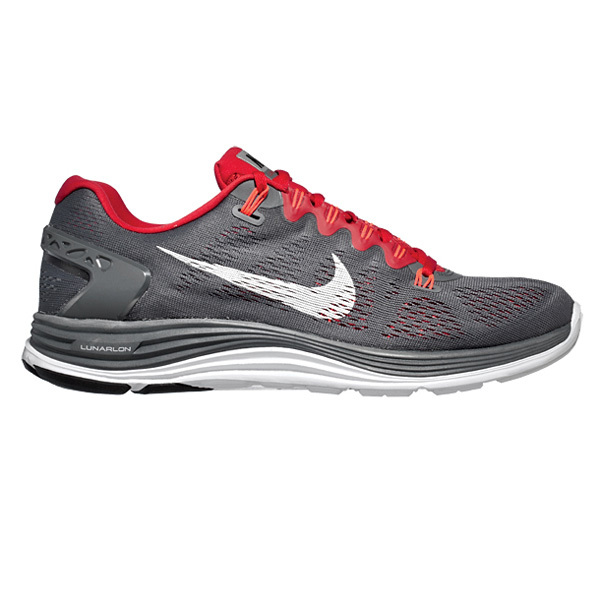 The Lunarlon shoes are designed with both comfort and performance in mind. 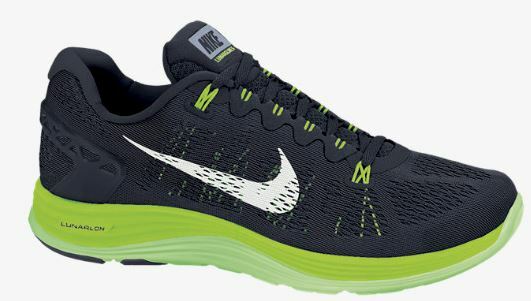 Although the Lunarglide 5 runs like a neutral shoe, it also has the Dynamic Support section that several of the other Lunar shoes have which makes it a stable shoe as well. Some shoes are comfortable but lack real support, and others are all about support but aren’t at all comfortable, but the Lunarglide 5 has both, with style to boot. 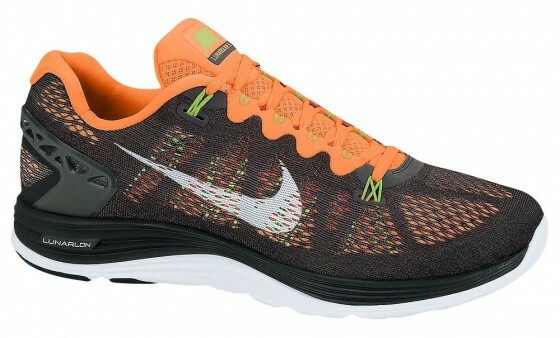 This entry was posted in Nike and tagged Nike Lunarglide 5, Nike Lunarglide 5 Running Shoe Review.